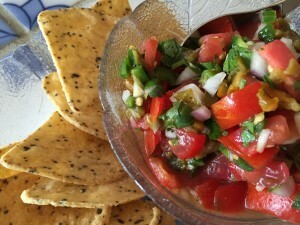 Tomato Salsa - Vegans Eat What? Vegans Eat What? This award winning salsa is from the Almost Vegan Cooking School. Combine all of the ingredients in a blender and pulse. Pour the salsa into a medium bowl and let it rest for 1 hour to give the flavors time to develop.